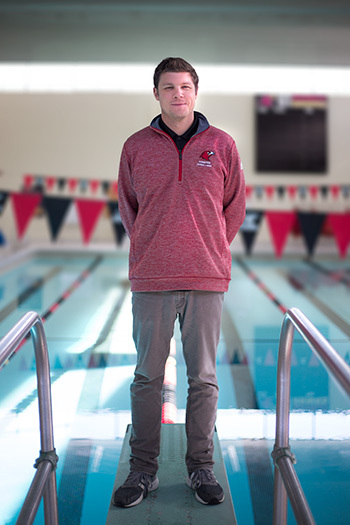 Kyllian Griffin, head coach of the Scarlet Hawks men’s and women’s swimming and diving teams, says that the student-athletes’ combined success at the 2018 Liberal Arts Championships came down to one simple reason. “We work really hard,” says the Appleton, Wisconsin, native, adding that all of their efforts in the water comes down to February, the month of the end-of-season championship meet, held at Luther College Aquatic Center in Decorah, Iowa. The men’s team placed third; the Lady Scarlet Hawks placed fourth, just two points behind the third-place team and five points behind the second. The women’s 200-yard medley relay team set the school record with a time of 1:49.67. 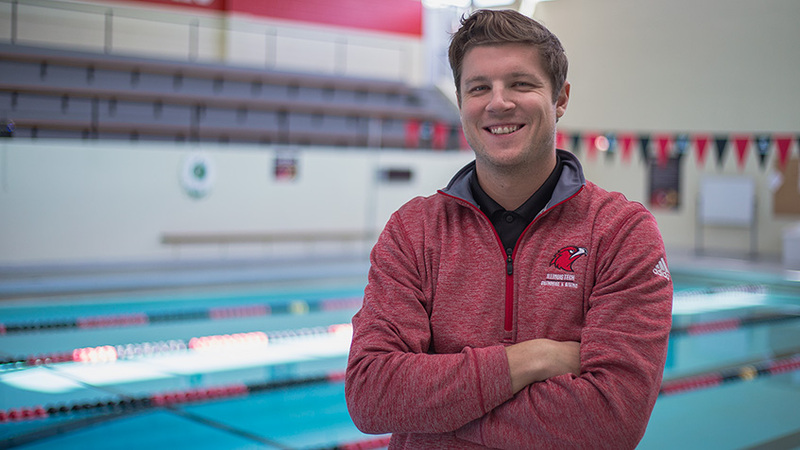 Griffin’s coaching style grew out of the hard work he put in as a student-athlete at Lawrence University, where he was a two-time Midwest Conference champion and a 19-time conference finalist. He also spent a total of seven seasons on the coaching staffs of Lawrence, Beloit College, and Pacific University, and part of that time served as a student affairs and residence life staff member. The son of a higher-education administrator, Griffin ensures that his close-knit team of 32 male and female student-athletes learn to apply the concept of community beyond the pool or their pasta night get-togethers. Team members have a standing volunteer commitment with the local Saint James Catholic Church and this year, Griffin, who volunteers as a member of Illinois Tech’s Staff Advisory Council, organized a trash clean-up session around Mies Campus. When he meets with each swimmer and diver every year to discuss their goals and expectations, he urges each of them to spread their wings beyond the water and their classrooms. “At the end of the day, I want them to have all types of experiences to build from so they can be ready for whatever may be next in their lives,” he says.